Fill our black favor pouches with candy and fun trinkets to remember all of the festivities. 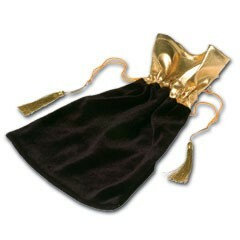 Each is accented with a gold lame and a tassel to pull string close. Our black favor pouches are 5 1/2" x 9 1/4" and sold by the piece. Please order in increments of 1 piece.